After recording an event win and four Top-10 efforts during the regular season, Alisson De Souza (Taubate, Brazil) used a runner-up finish at the Real Time Pain Relief Velocity Tour (RVT) Finals to propel him to the 2018 RVT Championship. Starting the season culminating event for the PBR’s (Professional Bull Riders) Velocity Tour at No. 13 in the series standings, 95 points behind then tour No. 1 Michael Lane (Tazewell, Virginia), the 25-year-old Brazilian went 2-for-3 inside South Point Hotel & Casino, collecting 225 world points, to surge to the top of the rankings. After covering Heartless (John Peck/Hale & Wallgren Bull Co.) for 87 points in Round 1, De Souza rebounded from a Round 2 buckoff early Saturday night with an 88-point, round winning ride aboard Handsome Jeff (K-C/Jo-Z Bucking Bulls) in the championship round. For his efforts, he earned $72,600, including the $50,000 RVT Champion bonus. Matching his rise up the RVT standings, De Souza also gained ground in the PBR world standings, rising to No. 34 after beginning the event No. 43. Courtesy of his newfound ranking inside the Top 35, De Souza has qualified for his career-first PBR World Finals. For the second time in his career, Chase Outlaw (Hamburg, Arkansas) won the RVT Finals event title, earning $29,600 and 320 world points. After winning Round 1 Friday night, Outlaw covered his eighth straight bull in Round 2, making the 8 aboard SW 506 (Winston/Slaughter/Melton Bull Co.) for 87.5 points. His streak, however, came to an end in the championship round when he was dispatched by Max Bet (Owens/Wyatt/Smith) in 5.11 seconds. Compliments of the win, Outlaw is now ranked No. 22 in the world, qualifying for his seventh consecutive world finals. Throughout the past month, Outlaw has mounted a historic climb up the world standings. While reconstructive shoulder surgery prevented the Arkansas cowboy from competing the entirety of the first half, he was forced back to the sidelines just two months after making his 2018 debut when he was involved in a horrific wreck at Cheyenne Frontier Days where he sustained 30 facial fractures. Since returning to competition on Oct. 6 at the Milwaukee, Wisconsin 25thPBR: Unleash The Beast event, Outlaw has risen 54 spots in the world standings, up from No. 76, collecting 865 world points. 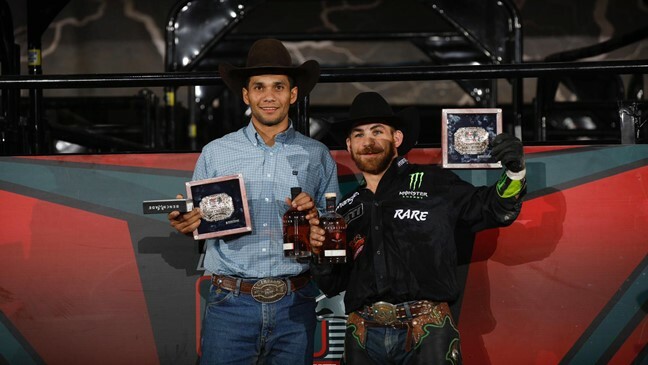 Luis Blanco (Iacanga, Brazil) and Paulo Lima (Bezerros, Brazil) tied for third at the event, both earning berths to the 2018 PBR World Finals. Blanco, followed his 88-point trip in Round 1 on Yatesy Down Under (Star E Ranch/Just Have Faith Ranch) with 81 points on Anonymous (Broken Arrow Bucking Bulls) in the championship round, netting 152.5 world points and $14,700. His qualification to the most prestigious event in the PBR, the fourth of his career, came as one of two top event finishers not ranked inside the Top 35. For Lima, his finish was backed by two 84.5-point efforts coming aboard Look Back At It (CO Cattle CO./Bob Whisnant) in Round 1 and Red Man (Halpain & Roth) in Round 2. The 30-year-old Brazilian collected 62.5 points and $7,700 for his efforts. Rising to No. 3 in the RVT standings, Lima punched his ticket to the World Finals for the fourth time in his career as one of the top two riders in the RVT standings not ranked within the Top 35. Juan Carlos Contreras (Huichapan, Mexican) finished fifth at the RVT Finals, earning him his second appearance at the World Finals as the second top finishing rider at the event not inside the Top 35. Collecting $4,900 and 40 world points, Contreras’ efforts were helped by back-to-back rides in the first two rounds, an 83-point ride on Memory Maker (Team KNK/The Jaynes Gang) in Round 1 and an 82-point trip on Real Gun (Cord McCoy/G-G) in Round 2. Despite going 0-for-2 at the event, Lane qualified for his second career World Finals via the Velocity Tour standings. Concluding the 2018 season No. 4, Lane delivered one of the most consistent seasons on the tour, recording an event win and eight Top 10 efforts. Tying for twelfth with Mason Taylor (Maypearl, Texas), PBR Mexico invite Francisco Garcia Torres (Sal, Mexico) qualified for his career-first World Finals as the top finishing international invite. Torres’ finish, which earned him 15 world points, was backed by his 86-point trip aboard Mr. Valentine (Rickey West Bucking Bulls) in Round 1. Round 2 also concluded the American Bucking Bull Inc. (ABBI) Derby and Wild Card Classic competitions. Over the past two days 90 3-year-old Derby bulls and 90 3- and 4-year-old Wild Card bulls went head-to-head in hopes of securing their spot at the top. Preacher’s Kid (K-C Bucking Bulls/RD Cattle) held on to his lead in the Derby with a 90.6-point performance for a payout of just under $28,000. Dirty White Boy (Andrews Rodeo Company), TNT 541 (Terrell/Smith) and Right Stuff (Craig Smith/Vern Nix) finished in a three-way tie for second after recording matching 88.2point scores, and each earning check for more than $12,500. Viper (Cord McCoy/Big Sky Bulls, LLC) won the Wild Card Classic title with 89.4 points to earn $14,025. Jaywalker (Torres Brothers Bucking Bulls) picked up 89.2 points for a second-place finish and $7,905, while Major League Bucking Bulls’ Full Count was third posting 88.4 points to collect just under $6,000. Compliments of their efforts at the RVT Finals, Wild Card Classic bulls Viper, Jaywalker, Full Count, Rugby (LeFlore Bucking Bulls) and Velocity (Andrews Rodeo Company) all qualified for the ABBI Classic Finals and will appear in Round 1 of the PBR World Finals on Wednesday. 1. Chase Outlaw, 88.5-87.5-0-176.00-320 Points. 2. Alisson De Souza, 87-0-88-175.00-225 Points. 3. Paulo Ferreira Lima, 84.5-84.5-0-169.00-62.5 Points. (tie). Luis Blanco, 88-0-81-169.00-152.5 Points. 5. Juan Carlos Contreras, 83-82-0-165.00-40 Points. 6. Sean Willingham, 84.5-77-0-161.50-25 Points. 7. Travis Maguire, 0-88.5-0-88.50-100 Points. 8. Jose Vitor Leme, 88-0-0-88.00-55 Points. 9. Edgar Durazo, 0-87.5-0-87.50-50 Points. 10. Silvano Alves, 0-87-0-87.00-20 Points. (tie). Cannon Cravens, 0-87-0-87.00-20 Points. 12. Mason Taylor, 0-86-0-86.00-10 Points. (tie). Francisco Garcia Torres, 86-0-0-86.00-15 Points. 14. Colten Jesse, 85.5-0-0-85.50-10 Points.